While planning our food stops for Chicago, I knew I wanted to hit up a local Ice Cream place. After posting on Chowhound, I was finding not too much about what the locals like. I guess those Chicago Folk are not like my common Cincinnati Folk. Ohh well…there loss. 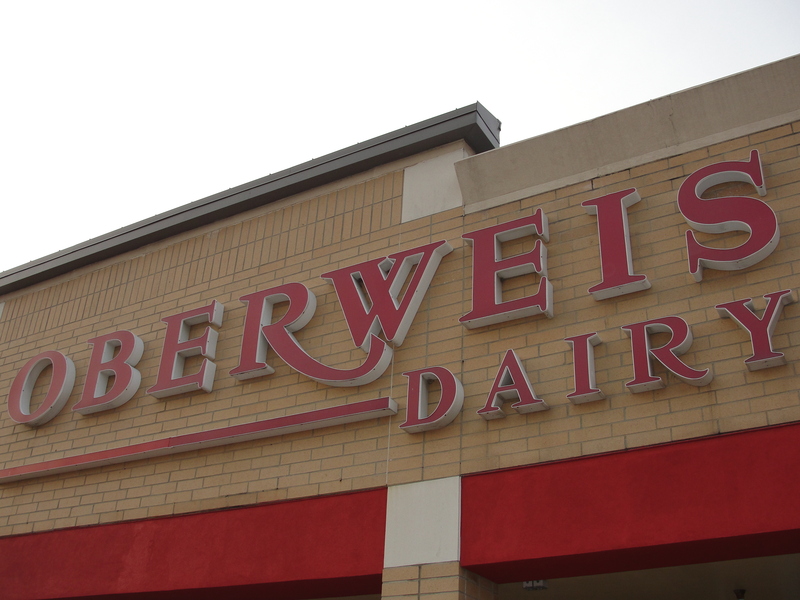 Finally, I was able to get some recommendations for a place called Oberweis Dairy. While I’m sure I have been pronouncing it wrong the entire time, they looked pretty legit. Ice cream made in the area, known for their milk, and a location close to the hotel – sounded like a winner to me. On our last night in Chicago, I informed everyone we would be having ice cream after dinner – it was not optional. After our great burger meal, we headed over to Get Oberweised. We walked into the Dairy and found the interior to be pretty huge. Besides the large counter area, there was a lot of tables and an entire dairy section. I grabbed myself a chocolate milk and then headed to the counter to order. I decided to go with my staple – Chocolate Peanut Butter Ice Cream with Hot Fudge & Peanut Butter Sauce served up in a Waffle Bowl. We made our way to our table and awaited our items. All of the staff working at Oberweis were extremely pleasant. They really aim for you to be able to spend some time here and enjoy every second of it. While waiting for my Ice Cream, I downed the Chocolate Milk. I found the Milk to be good but, nothing out of the ordinary. It was just good chocolate milk…I can’t really say too much else about it. The flavor wasn’t overpowering and the consistency was smooth. After a few minutes, our ice cream was served to us – in real bowls. Pretty different from the usual paper bowls. Mine of course was in a Waffle Bowl but both Mommy and Taylor received glass bowls. That’s one fancy cat. The look of my ice cream was good. 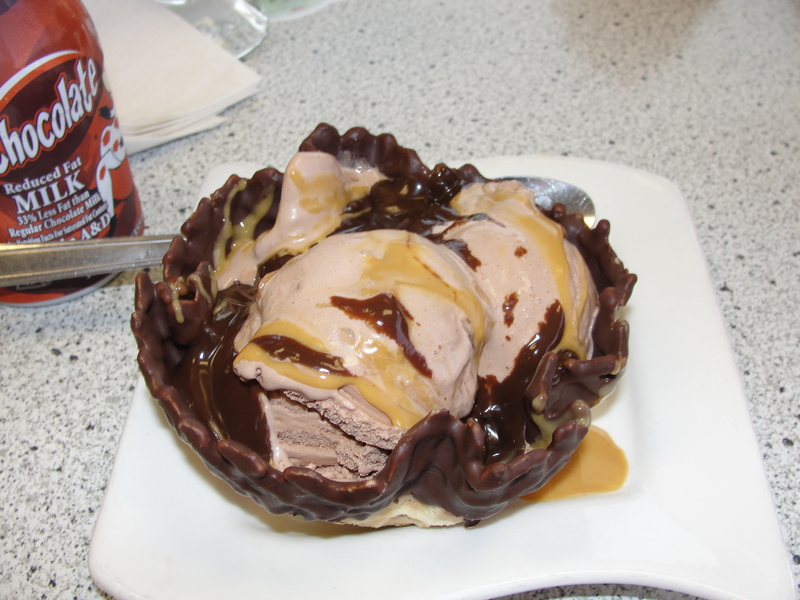 While I didn’t see any peanut butter pieces within the ice cream, I saw plenty of peanut butter sauce on the top of it. I dug right in and found it to be good ice cream. The ice cream was much more chocolate than it was peanut butter. The consistency was very, very smooth – similar to the chocolate milk. While the flavor of the chocolate was the dominating flavor, I could also taste hints of peanut butter. The peanut butter sauce on top was able to provide the extra kick I so desired. Not only was the peanut butter sauce purely peanut butter heaven, it was also warmed to the perfect temperature & incredibly smooth. I could have eaten just a bowl worth of this sauce. And let’s not forget about the hot fudge – it was pretty killer too. extremely dark in flavor, the hot fudge was hot, thick and oh-so-gooey. Every single bite of the ice cream I received, with both peanut butter and hot fudge, was a pure party in my mouth. Oh. My. Gosh. Amazing. I did indeed enjoy the ice cream & toppings from Oberweis, as I did the waffle bowl. The waffle bowl was fresh, sweet, crispy and held up containing my ice cream. I ate most of the bowl after I had finished the ice cream and I did not run into any strange flavors or textures throughout the bowl. This ice cream is certainly not Graeter’s – nothing can compare – but, it is good. Besides the fact of the good ice cream, the friendly service & inviting atmosphere, would be certain reason to return. And be sure when you get a chance to visit, you try that peanut butter sauce and hot fudge. I promise this will provide a pure party in your mouth and you not only get schooled, but also, Get Oberweised.